By themselves, graphene is too conductive while boron nitride nanotubes are too insulating, but combining them could create a workable digital switch — which can be used for controlling electrons in computers and other electronic devices. 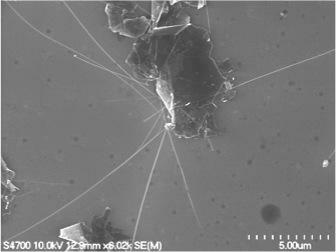 To create this serendipitous super-hybrid, Yoke Khin Yap, a professor of physics at Michigan Technological University, and his team exfoliated (peeled off) graphene(from graphite) and modified the material’s surface with tiny pinholes, then grew the boron nitride nanotubes up and through the pinholes — like a plant randomly poking up through a crack in a concrete pavement. That formed a “band gap” mismatch, which created “a potential barrier that stops electrons,” he said. In other words, a switch. The band gap mismatch results from the materials’ structure: graphene’s flat sheet conducts electricity quickly, and the atomic structure in the nanotubes halts electric currents. This disparity creates a barrier, caused by the difference in electron movement as currents move next to and past the hair-like boron nitride nanotubes. These points of contact between the materials, called heterojunctions, are what make the digital on/off switch possible. Yap and his research team have also shown that because the materials are respectively so effective at conducting or stopping electricity, the resulting switching ratio is high. So how fast the materials can turn on and off is several orders of magnitude greater than current graphene switches. And this speed could eventually quicken the pace of electronics and computing. Yap says this study is a continuation of past research into making transistors without semiconductors. The problem with semiconductors like silicon is that they can only get so small, and they give off a lot of heat; the use of graphene and nanotubes bypasses those problems. 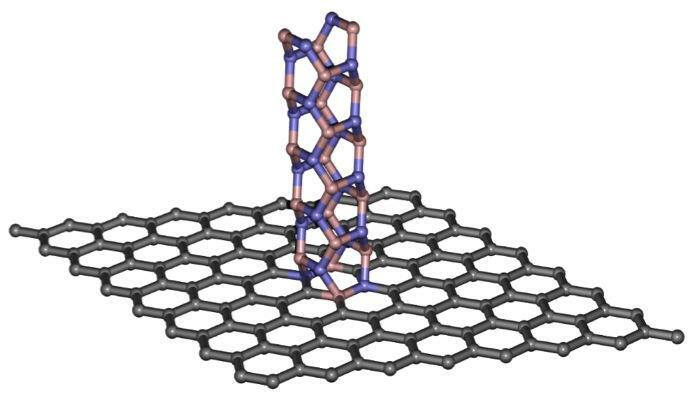 In addition, the graphene and boron nitride nanotubes have the same atomic arrangement pattern, or lattice matching. With their aligned atoms, the graphene-nanotube digital switches could avoid the issues of electron scattering. The journal Scientific Reports recently published their work in an open-access paper. High electron mobility of graphene has enabled their application in high-frequency analogue devices but their gapless nature has hindered their use in digital switches. In contrast, the structural analogous, h-BN sheets and BN nanotubes (BNNTs) are wide band gap insulators. Here we show that the growth of electrically insulating BNNTs on graphene can enable the use of graphene as effective digital switches. These graphene-BNNT heterojunctions were characterized at room temperature by four-probe scanning tunneling microscopy (4-probe STM) under real-time monitoring of scanning electron microscopy (SEM). A switching ratio as high as 105 at a turn-on voltage as low as 0.5 V were recorded. Simulation by density functional theory (DFT) suggests that mismatch of the density of states (DOS) is responsible for these novel switching behaviors.